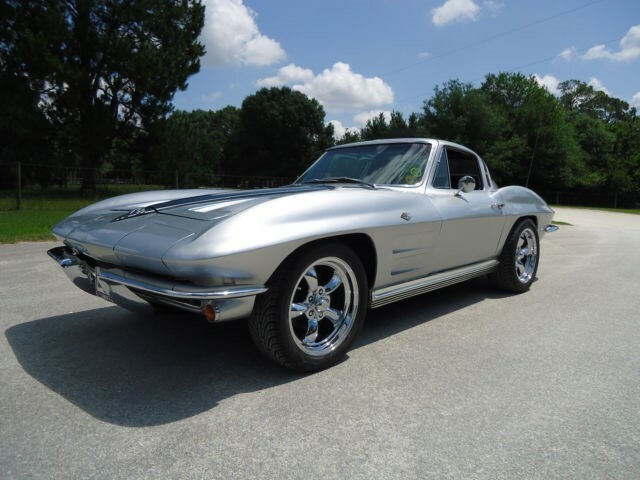 C2 - 327 ci V8, Manual 4 Speed, Silver Mist with Red Leather, very nice! The fabulous 327 ci V8 engine (the hot rodder’s choice) in our Roadster has a hot cam. Coupled to a 4 speed on the floor, this Ray is a dream to drive. We think the American Racing Equipment wheels suit the car, the red hot leather interior is so much better than black, but we like black too, and white! 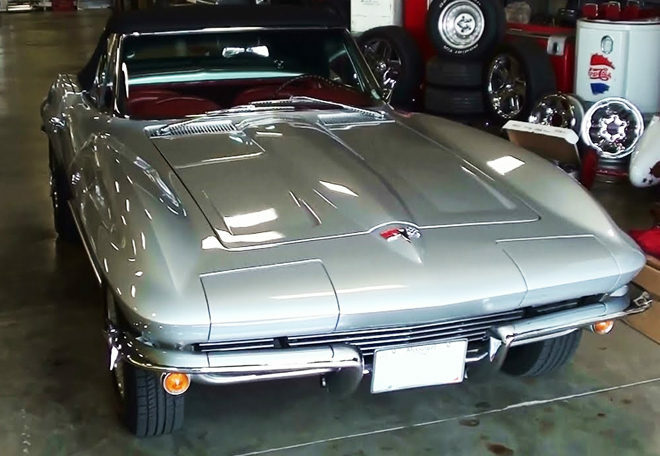 For 1964 Chevrolet made only evolutionary changes to the Corvette. Besides the coupe’s backbone window, the two simulated air intakes were eliminated from the hood, though their indentations remained. Also, the decorative air-exhaust vent on the coupe’s rear pillar was made functional, but only on the left side. 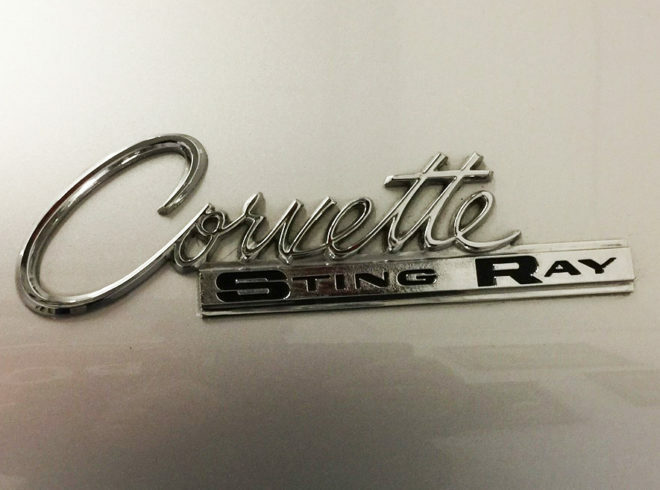 The car’s rocker-panel trim lost some of its ribs and gained black paint between those ribs that remained; wheel covers were simplified; and the fuel filler/deck emblem gained concentric circles around its crossed-flags insignia. Inside, the original colour-keyed steering wheel rim was now done in simulated walnut. A few suspension refinements were made for 1964. 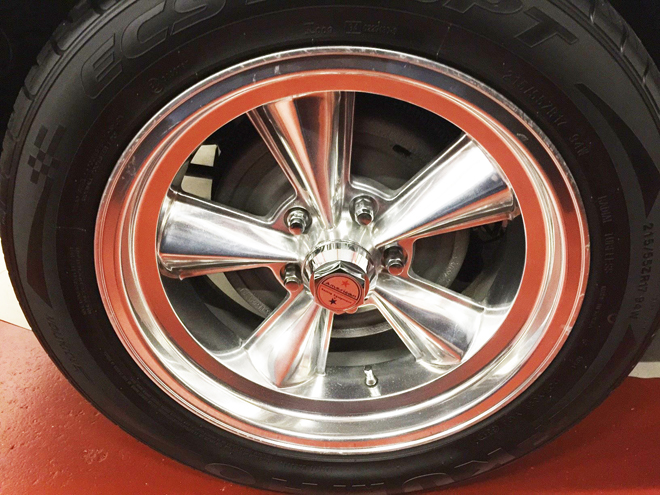 The front coil springs were changed from constant-rate to progressive or variable-rate and were more tightly wound at the top, while leaf thickness of the rear transverse spring was also altered thus providing a more comfortable ride with no sacrifice in handling. Shock absorbers were reworked toward the same end. 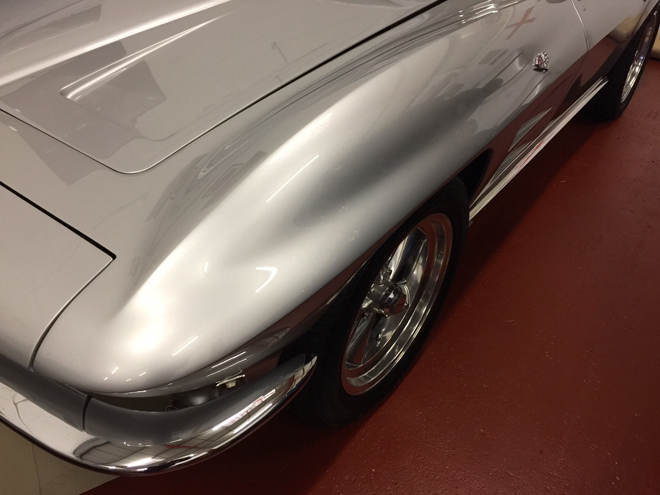 The 1964 Corvette arrived with a new standard shock containing within its fluid reservoir a small bag of Freon gas that absorbed heat. 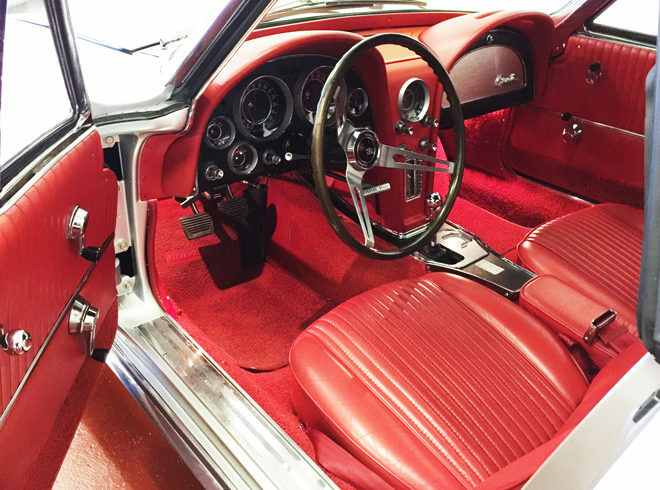 Chevy added more sound insulation and revised body and transmission mounts for the 1964 ‘Vette. It also fitted additional bushings to quiet the shift linkage and placed a new boot around the lever. The result was a more driver friendly car for everyday transportation. 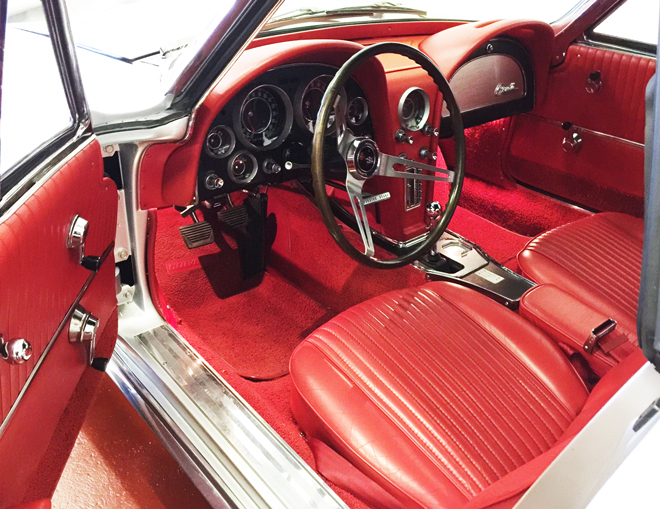 Although transmission options remained ostensibly the same for 1964, the two Borg-Warner T-10 four-speeds gave way to a similar pair of gearboxes built at GM’s Muncie, Indiana, transmission facility. 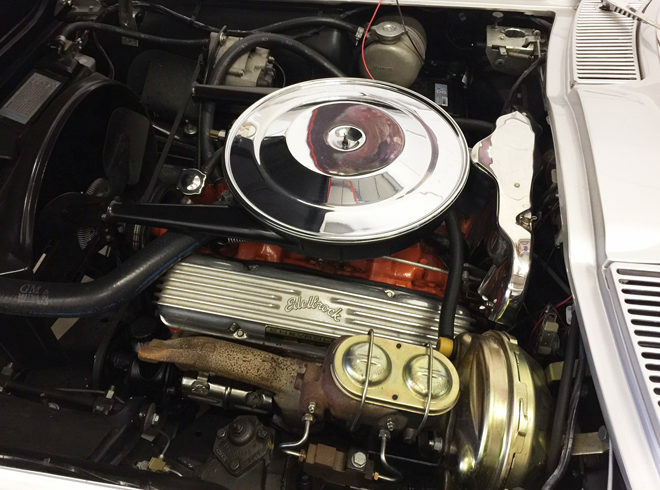 Originally a Chevy design, it had an aluminium case like the Borg-Warner box but came with stronger synchronizers and wider ratios for better durability and drivability. 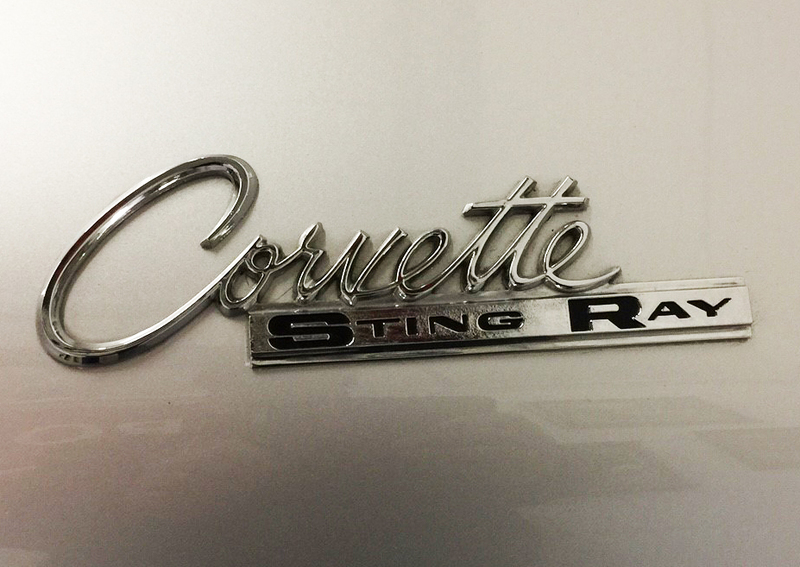 Of the 22,229 Sting Rays sold in ’64 (another new Corvette record), the Roadster version accounted for 13,925. File image, when it stops raining we will post actual photos!